With the help of Jeff, CEO of Mulligan’s Painters and Palestino, the So Cal Titans were able to make the last minute trip to join in the Las Vegas Kickoff Tournament. The So Cal Titans showed their strength and came out 7-0 and undefeated for the tourney, topped off with the victory over the So Cal Royals in the championship game. Pitchers M. Rodarte, E. Miranda, L. Kawosky, G. Guzman, Spencer T., L. Trinidad and J. Iniguez were able to pull off win after win. They received great support from the amazing hitting and defense portrayed by the rest of the team and with the back up of manager Enrique Rodriguez. 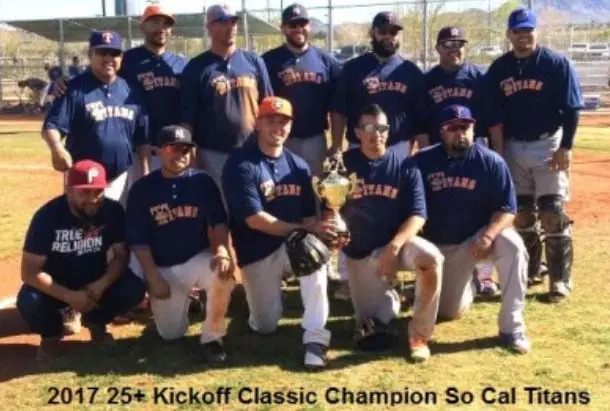 The So Cal Titans came out champions from the 25+ division with their 9-2 victory.